Backup failed as shadow copy on source volume got deleted. This might caused by high write activity on the volume. Please retry the backup. If the issue persists consider increasing shadow copy storage using 'VSSADMIN Resize ShadowStorage' command. I've tried three times. I did a restart. No help. I've done an internet search, and the best I can come up with is that Windows doesn't support this functionality anymore and I should use a third party software for creating a system image. Suggestions? Personally, I would recommend that you do not use the Windows 7 Backup and Restore component. It has been deprecated and the rumor is that it will be abandoned in a future Windows 10 version update. It is inferior compared to the dedicated backup/imaging programs, both paid and free, that are available. 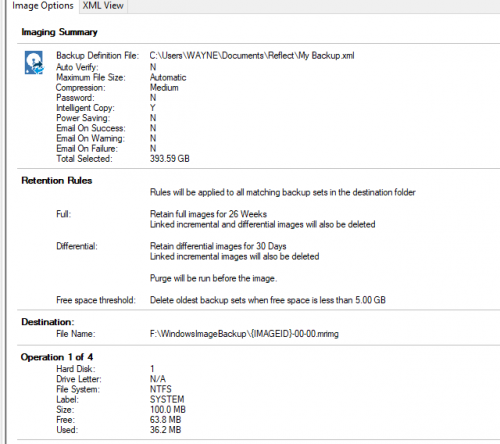 I would recommend that you look at Easeus Todo Backup Home or Macrium Reflect as imaging solutions. I use the paid versions of both. They both also have free versions. Be sure that whichever product you select, and there others like Aomei Backupper, that you create the recommended rescue media so that you can boot your computer from a DVD or USB drive and restore your image, in the event of a catastrophic hard disk drive failure. From what I can tell, you have selected to image four partitions on your hard disk 1. Am I correct in assuming that your data files are on Drive C:? If so, then there is no need to backup your data files using Macrium or Windows as a separate operation. In fact, Windows 7 Backup and Restore doesn't provide an option to just back up data files, except for the File History function in later Windows versions, which requires another drive to be more or less permanently connected to your computer. That would make your backups vulnerable to a ransomware or other malware attack, unless they were protected by Macrium Image Guardian, and I don't know if that is available in the free version of Macrium. Personally, I create system images weekly of both of my computers to external drives, connected only long enough to create the image files, to avoid having to reinstall Windows and other program updates, and I thereby have fresh backups of my changed data as well. With Macrium, you can mount an image file and just restore the file or files that you want; you don't have to do a full restore. For changing data files, you can also create a robocopy batch file or use Synctoy to backup all modified data files. 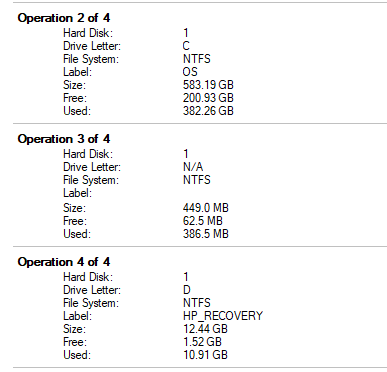 From what I can tell, you have selected to image four partitions on your hard disk 1....I did? I don't know if that's what I needed to do or not. What should I select? Am I correct in assuming that your data files are on Drive C:? Yes If so, then there is no need to backup your data files using Macrium or Windows as a separate operation. In fact, Windows 7 Backup and Restore doesn't provide an option to just back up data files, except for the File History function in later Windows versions, which requires another drive to be more or less permanently connected to your computer. That would make your backups vulnerable to a ransomware or other malware attack, unless they were protected by Macrium Image Guardian, and I don't know if that is available in the free version of Macrium....I have an external backup drive connected to my PC at all times, so the scheduled backups can run in the middle of the night. Of course, as you point out, if I get ransomware, that could ruin C: and the external drive. Personally, I create system images weekly of both of my computers to external drives, connected only long enough to create the image files, to avoid having to reinstall Windows and other program updates, and I thereby have fresh backups of my changed data as well....So if you need to restore from your image, your data could be up to a week old? With Macrium, you can mount an image file and just restore the file or files that you want; you don't have to do a full restore. For changing data files, you can also create a robocopy batch file using Macrium? So I could potentially save my latest file changes every night? If so, that sounds good. How would I do that? or use Synctoy to backup all modified data files. 1. I would recommend that you create a system image with all partitions on your disk. That way, you can restore everything in one restore operation. 2. I manually initiate and monitor my weekly backups, so I don't do things the way you do, not that there is anything wrong with scheduled backups. You are aware of the risks of having your backup drive permanently connected to your computer. It is your computer and your data, and each person has their own personal risk tolerance. As a malware removal specialist, my risk tolerance is very, VERY low, as I have seen too many lose so much in an instant, whether due to malware, a botched Windows update, or hardware failures. 3. My system images are done weekly. I backup modified data files immediately after they are created to an internal backup drive, and I have File History turned on. No, you wouldn't use robocopy to initiate a Macrium data file copy. Robocopy is a Windows command for bulk copy operations. You can google "using robocopy to copy files" and you will get all kinds of hits, like this one. I also use Synctoy for double redundancy. More information can be found here. Thank you for your post. You can check out this topic in the Macrium Forum. It might help you. If you selected all the partitions that were shown, then there is no need to run any other backup jobs, since you have imaged the entire drive and all of its partitions. OK. Is there a log that shows me when the last image backup ran and if it was successful? I couldn't find one. I can't be sure if the Free version does logging, because I use the paid version. In the paid version, there are three tabs at the top left of the screen: "Backup", "Restore" and "Log". Click the "Log" tab and the backup logs are there, at least with the paid version. Alternately, you can check the "Restore" tab and see if your backup is listed there. If you hover your cursor over the backup in the "Restore" tab, it will give you the details of the type of backup. You also have the option to browse the backup. I have the Log tab same as you. It states: "Image Completed Successfully in 01:29:16". I have 388 GB of used space on my C drive. Windows image backup would take at least 14 hours. Do you think Reflect is doing the whole image then? I think Macrium got it all. My primary desktop has 135 GB of data on a Samsung 850 Pro 1 TB SSD, writing to an internal 600 GB WD Velociraptor (10,000 RPM) HDD. The computer has an i7 Processor, overclocked to 4.4 GB, and 16 GB RAM. The image of all my partitions on that SSD drive takes Macrium Reflect Pro 7.2 about 15 minutes! On the basis of that, I would strongly suspect that Macrium did image the entire contents and all partitions on your Disk 0. Windows 7 Backup and Restore was notoriously slow and unreliable, and not at all flexible. As I told you, that program has been deprecated by Microsoft and the rumor is that it will be discontinued in a future Windows 10 version update. It is probably the worst backup software out there. I hope this helps and sets your mind at ease. You can mount the backup image to confirm that it is all there using Macrium. Have a great day. "mount the backup image"...How do I do that? You could simply google mounting an image or check the Macrium Help. In any event, here is a link that tells you how to mount a Macrium Reflect image. I guess that's all then. Thanks for your time, Phil.